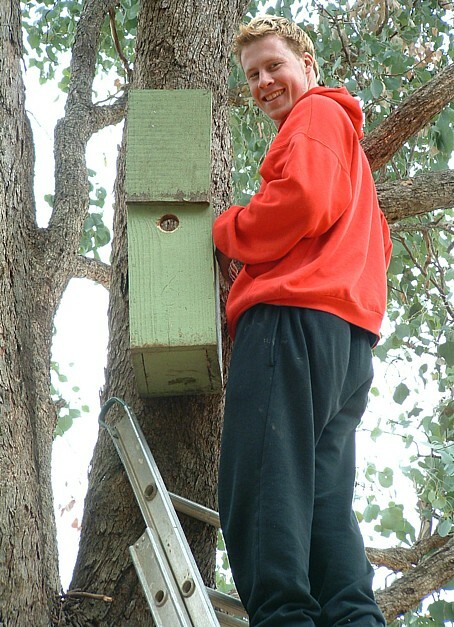 A keen volunteer discovering who's at home in this well used nest box. A family of Squirrel Gliders snuggled up for the day after a hard night out! It's often difficult to count how many animals are present, but there are usually enough bits and pieces visible to make a good estimate. Note that our boxes are on the shady side of a tree, for coolness in summer. Here we see the distinctive nest of shredded stringybark, wool, feathers and so on that is so typical of Brush-tailed Phascogales. We've seen several nests but not the animals themselves. Maybe this year!! Perhaps you'd like to see some of the beautiful little creatures we are working to protect up here at Lurg. Our nest box program has been in operation for 20 years now, and we'd like to invite you to join us as we do our annual monitoring work. We have 391 nest boxes in place, with Sugar Gliders and Squirrel Gliders nesting in just about all of them! We're even starting to find the distinctive nests of rare Brush-tailed Phascogales, so we're likely to see some of them face to face when we go checking this year! We'll also be placing some new boxes to help the animals move around the district more easily. The basic problem is an extreme shortage of natural tree hollows because the old trees were heavily cleared decades ago, and the regrowth forests are still far too young to have many hollows. These extra boxes will provide crucial shelter and breeding sites that are absolutely the bottom line to support a growing population. We'll also be placing some new boxes out in likely looking habitat. The regrowth forests of Lurg have very few natural hollows so our nest boxes are crucial habitat for last year's offspring when they leave home to make room for next year's babies. After dark we'll be spotlighting to search for wildlife in several of our oldest planting sites. With binoculars at the ready we get delightful views of the nightlife as they forage through the tree tops, and sometimes we are lucky enough to see the rare Squirrel Gliders in action. Do come and join us. You'll be helping the wildlife for sure, and it's a first rate opportunity to enjoy some close contact with nature. It's also a good opportunity for you and your friends to meet some new people, while you're all having some fun together in the great outdoors. 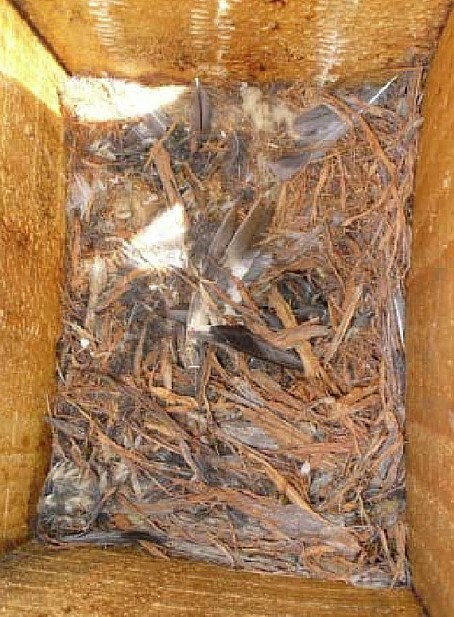 why do we need nest boxes? It's pretty simple really; much of the regrowth bush in Lurg is still too young to have hollow branches, so the wildlife don't have enough holes for shelter and breeding. Rare species like Squirrel Gliders and Brush-tailed Phascogales need all the help they can get! why check them every year? Regular checking is important so that we can find the extent of local populations, the habitats they prefer, the breeding success of particular colonies, and barriers to their movement across the landscape. 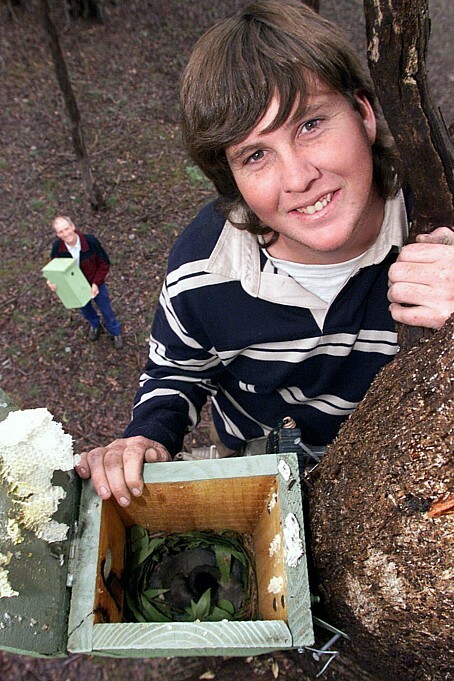 We also need to get accurate reports of unwanted species (such as feral bees) taking over our boxes, so that we can remove them at a later date. how do we use the results? 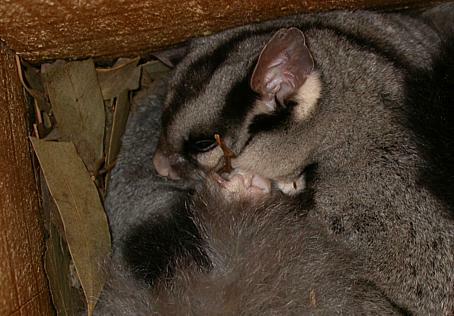 Results from several years have given conclusive evidence that gliders need the fertile soils along creeks to breed successfully. Our records also show that gliders move out of the dry hills down to the creeks every summer, and they absolutely need continuous corridors to do this safely. So any major breaks in the tree cover along roadsides or creeks, become serious barriers to glider populations. Isolated 'islands' of habitat have proven empty, because the gliders have been hunted out and they haven't replaced themselves. Solid information like this makes it possible to know what needs doing and also where to act in order to make the most difference with our efforts. These weekends provide an excellent opportunity for bushwalkers to practise their map reading and navigation skills while looking for the nest boxes. The 391 sites are all mapped carefully on 1:25.000 contour maps, with grid references and brief location descriptions. 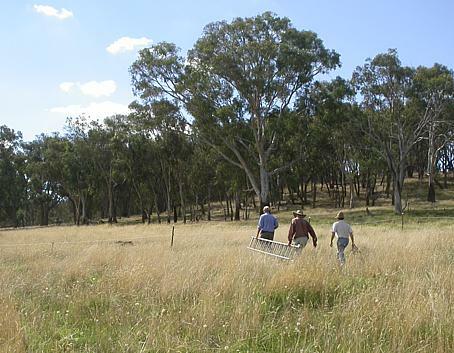 Last but not least, there are many delightful bushland areas to enjoy in the process. All of the box locations have also been recorded by GPS, so feel free to bring one along if you'd find it helpful. Note that it’s critical to use the GDA 1994 mapping co-ordinates to ensure you are at the correct nest box. Look for UTM/UTS WGS 84 in your GPS menu. Check our attached flyer for this seasons details. Please let Ray know how many people to expect so he can make arrangements. Andie Guerin: phone: (03) 5761 1515. Send an email to Andie here.